You are currently browsing the tag archive for the ‘sleeping horses’ tag. Saturday was a glorious day at the pasture. The weather was in the high fifties and honestly it seemed more like spring than January. You may think I talk a lot about the weather. Sometimes I fear that I sound like Goldilocks in the children’s story where her porridge was either too hot or too cold. My challenge is to learn to simply be in the present with whatever weather the day brings. It’s not as easy as it sounds, but it is an ongoing opportunity to practice being present to my life. 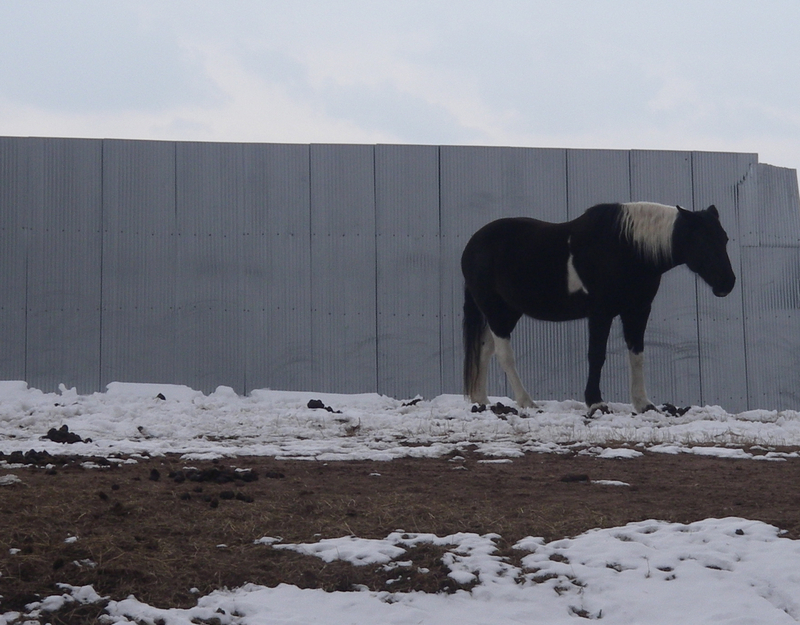 Bud, Pepper and I were in the middle of our routine – they were eating and I was hanging out with them and handing out snacks to the usual characters lined up at the fence. The sun was warm on my back, birds sang from the stack of pallets that they’ve turned into a bird condo, and the horses were relaxed, mellow really. 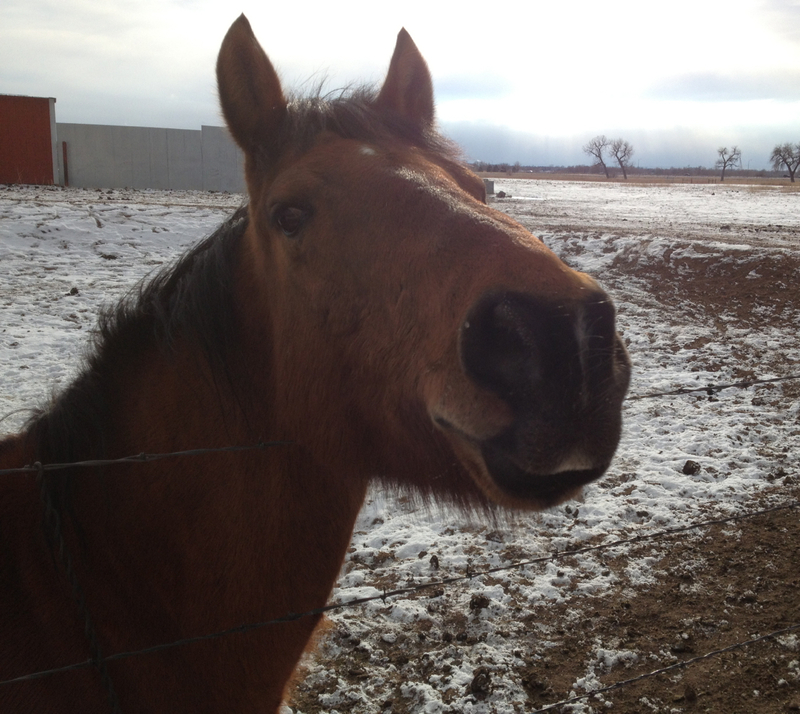 Then I heard a familiar noise, though one I don’t usually hear when I’m with the horses. It was a sort of wheezy, rhythmic breathing. It wasn’t the gang at the fence. They were bright-eyed and into the snack game. I looked around thinking it might be Tucker, the golden retriever that lives on the property and often drops by to inspect my work and say hello. Nope. There was no Tucker in sight. There were two horses in the adjacent paddock, also very hopeful that I would drop a hay cube their way. He was grooving on the sun and snoring away. I tiptoed closer hoping to get a photo for you, but his warning system activated and as I got close enough for the picture, he got up. I’m convinced prey animals sleep with one eye open. It’s how they stay alive. I felt a little guilty for interrupting his nap. I apologized and headed back to my two old sweeties. 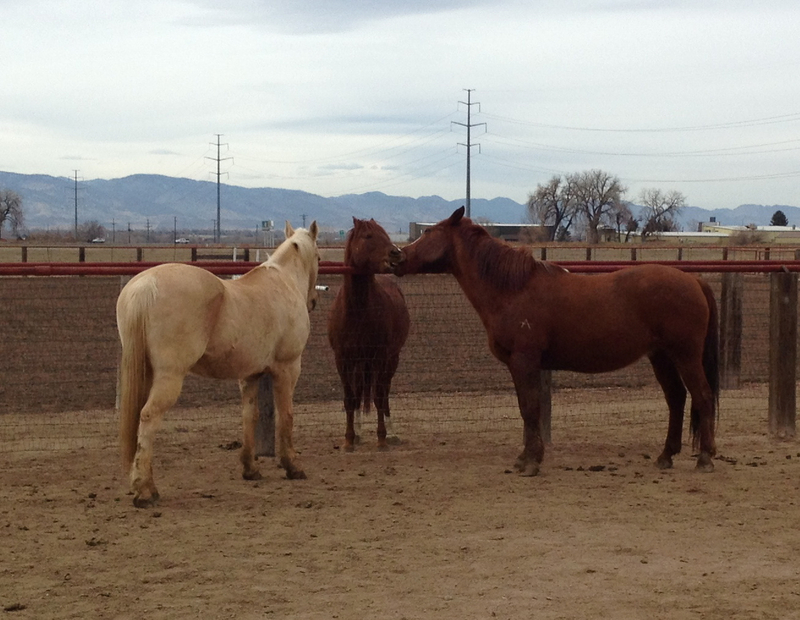 When I turned to look at the paddock again, I saw all three horses standing at the fence talking. They may have been talking about me and how silly I was to try and sneak up on a horse. They nodded heads, snorted and every so often sent a glance toward me. Of course they could have been discussing the Super Bowl, or the skyrocketing price of hay. P.S. We have a blog name for out latest visitor to the Herd of Oldsters. Thank you for taking time to vote! 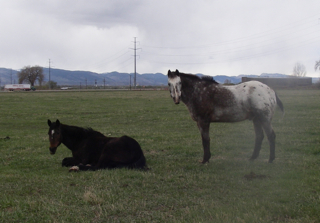 Horses sleep standing. They lock their legs and drift into dreamland – as so aptly demonstrated by the horse in this photo. The sky was grey and threatening more snow. There wasn’t much to do. No grazing for sure. And it was a long time until the hay truck was going to make its way back into the pasture. What’s a horse to do but sleep? To be able to sleep while standing is a skill we humans could use. Think about all those folks waiting in line for the next greatest Apple product. They could so benefit from being able to remain standing while catching up on sleep. Multi-tasking at its best. Or the post-Thanksgiving shoppers. The ones that gather in the wee hours of the morning to be first in line to snag all those unbelievable deals. To hold your place in line and remain upright could really help. Unlike horses, we humans must lay our tired bodies down in order to sleep. Horses are prey animals. That means they’re hard wired to run like crazy at the first scent of a predator. If you’ve ever watched a horse lying on the ground get up, you know it’s a rather slow process. If a mountain lion were approaching, that sleeping horse would be extremely vulnerable. 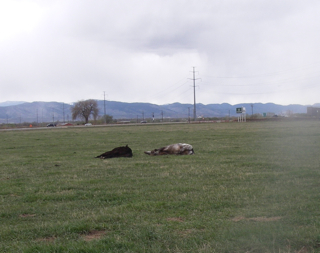 Horses do on occasion stretch out on the ground. But they have to feel safe. You’ll sometimes see herd members standing watch while one or two sleep. 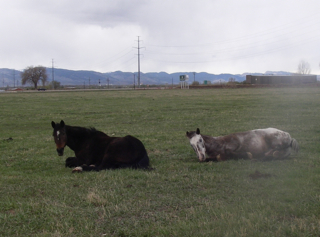 In the pasture where Bud and Pepper live, horses do take naps on the ground. Especially on quiet, sunny days, we’ll see horses dozing in the sun, soaking up heat. Even our two old sweeties need to rest their legs now and then. All this talk of sleeping horses makes me wonder this: Are you a napper? For the record I definitely fall into the “yes” category. Love, love, love taking naps. It feels like one of life’s ultimate luxuries. One of the neighbors enjoying a nap in the sun. One of the charms of living in Colorado is the way the weather can change on a dime. Just when you think you’re going to have to hunker down for a long, cold winter, the sun comes out, melts all the snow and you end up needing nothing more than a lightweight coat or sweatshirt instead of your down parka. “Don’t like the weather? Wait five minutes,” is a popular saying. We’ve been enjoying some very nice weather these past few days – close to sixty degrees. The horses have been basking in the sun, napping and soaking up all that warmth. We even removed Bud and Pepper’s coats. Yesterday though in the middle of a perfectly gorgeous afternoon, we began to worry about our two old sweeties. The forecast called for a huge drop in temperature overnight and possible snow. Not a good combination for our sweet old things. The last thing we want is for them to spend their precious calories keeping warm. They both have lost weight this winter as it is. So at the end of the day, in the dark, we convinced ourselves to head out to the pasture and put the coats back on. Bud and Pepper were a little confused, but bless their hearts, they came running when Rick whistled. We handed out snacks and buckled the coats back on. And as the wind rattled our windows in the wee hours of the morning, I rolled over for a few more minutes of sleep, happy that we’d gone to the extra effort. So I can’t fault my horses for taking a little down time to enjoy the fact that it wasn’t windy. So when I went out to feed them yesterday, they weren’t at the gate. They weren’t even close to the gate. Smack, dab in the middle of the pasture. Asleep. No one even moved when I called. This freaked me out, because they looked, well, not alive. 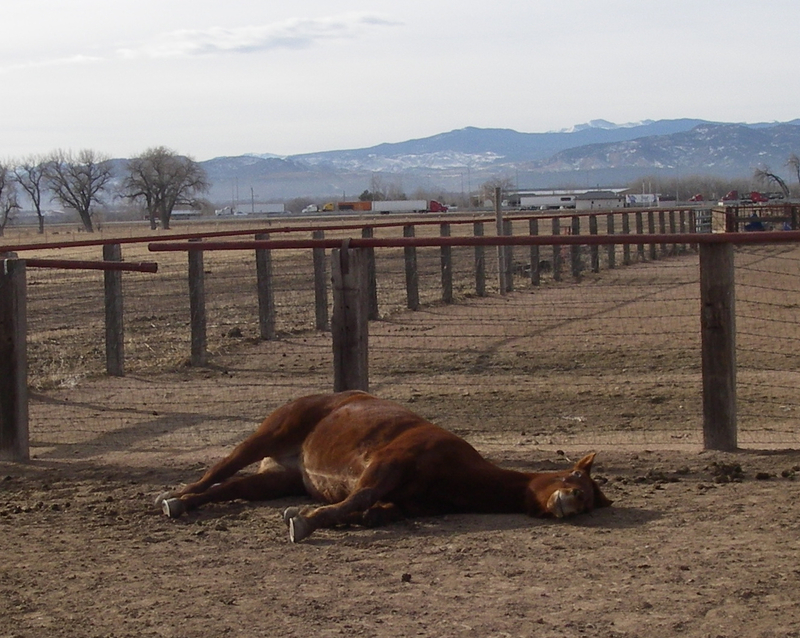 I sometimes joke about dead horses in the pasture when I see them sacked out, but with my two old sweeties, it’s not so funny anymore. A little too close to reality. I opened the gate and walked toward the sleeping beauties. “Hey Bud, wanna eat?” I called out. That usually gets him. He lives for food. Whew. I was relieved to see movement. Up popped one head. Then the other. It took Miss Pepper a couple of minutes and some elaborate stretching to get herself moving. Arthritis is no fun. In the end, both she and Bud made it to the chow wagon. The moral of this story: A little napping in the middle of the day is a good thing. For all of us – horse and human. So if you’ll excuse me, my bed is calling.